27+ Trends and Key Features of Mobile Banking Apps in 2018 - Ignite Ltd.
Financial services have undergone a huge technological shift in a relatively short time. Driven by the evolution of technology and growing customer demands, banks are turning to modern software, connected devices, and the web to manage highly sensitive data between customers, investors, and employees. And it should come as no surprise that mobile banking app development is front and center. Modern banks appreciate that their customers are more mobile than ever, accessing their accounts via smartphone and tablet devices while on the go. If they cannot deliver their core services in a secure and simple-to-use app, they risk losing that customer to the competition. Today, you’d be hard pushed to find a global bank not offering mobile banking as part of its overarching service. 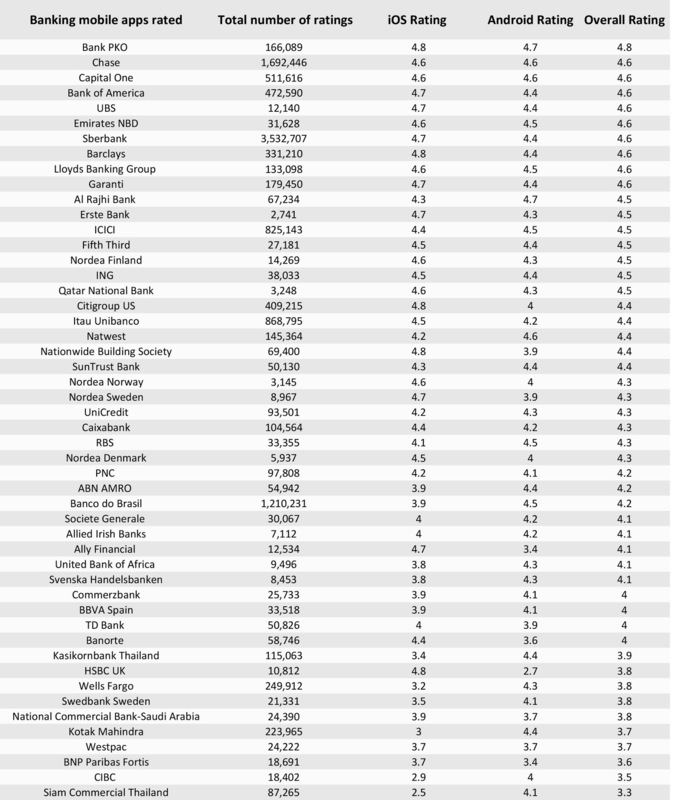 In fact, here’s a list of 50 of the world’s top retail banks, ranked in order of their overall app rating (source). What’s more, leading analysts Juniper Research suggest that by the end of 2018, 2 billion people will use their smartphone device for digital banking purposes – that’s almost 40% of the global adult population. That same Juniper Research report points to emerging markets contributing to the significant growth of user numbers. India, China, and Bangladesh have all seen a steady increase in smartphone availability and new and innovative banking services. Southeast Asia has witnessed rapid growth in digital banking, with the number using it doubling over a three-year period across Malaysia, Singapore, Cambodia, Laos, and Philippines – and digital banking grew sevenfold in Vietnam and Indonesia. Latin America remains an untapped market, but banks are now making moves to go digital. 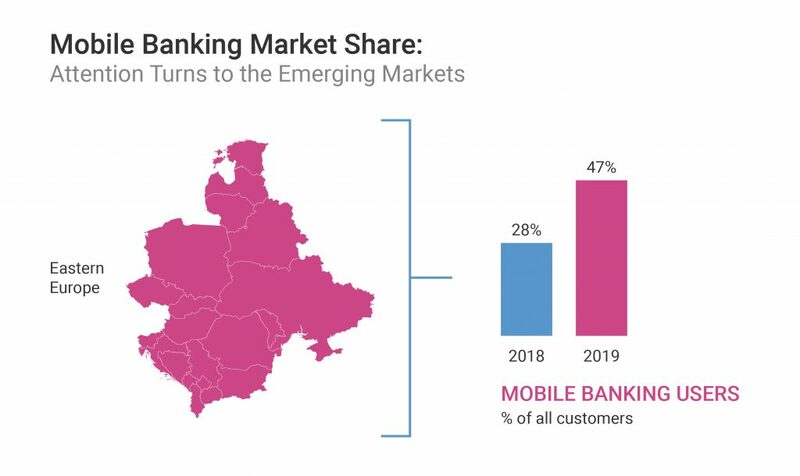 And in Eastern Europe, the uptake of mobile banking has outstripped even Asia, with mobile banking users expected to jump from 28 percent of all customers to 47 percent by 2019. Mobile devices, according to McKinsey, can reduce the cost of serving customers by 50 to 70 percent. By closing the gap between banking and technology – and giving the so-called ‘unbanked’ an opportunity to engage with financial and banking services – mobile banking app development could positively impact a large and subsequently profitable market. However, that’s only part of the story in 2018. Branch visits are declining, physical bank branches are closing, and the banking sector (and its stakeholders) are demanding new and improved banking options. And all of this means there’s an even greater opportunity for startups and forward-thinking banks to enter and disrupt the mobile banking scene. But before this can happen, you first need to consider the target audience. While you might expect the vast majority of mobile banking app users to be affluent, tech-savvy, Western millennials, the truth is, the user base is far more diverse. A 2015 banking trends presentation by financial data company MX highlighted the shifting demographics using banking apps to manage their money. Most notable is the 45% of Baby Boomers and Seniors using mobile/digital banking at that time. More recently, an article by the Financial Brand points out that 18-24-year old consumers represent the most engaged segment of mobile banking users, with 82 percent of smartphone owners in this bracket using mobile banking apps. Meanwhile, only 29 percent of the 65 plus bracket of smartphone owners use mobile banking. However, what’s true of just about every demographic – as illustrated in the Financial Brand article – is the fundamental change in our relationship with banking. In 2012, only 27 percent of consumers engaged with online or mobile banking. By 2017, this had grown to 46 percent, while human interaction channels (branches, call centers) had shrunk from 15 to 10 percent. And, according to Net Finance, modern consumers will typically interact with their banks between 15 and 20 times a month, compared to the 3 to 4 times prior to the digital era. In the face of this rapid growth and evolving user base, banks and financial institutions must contend with the shifting expectations and experience of their users. With the majority of consumers now increasingly tech-savvy and aware of competing alternatives, it’s never been more important to deliver a user friendly application at the first time of asking. Trust, convenience, and usability are all concerns that must be addressed when launching a new banking app. So, what are the expectations of 2018’s banking customers? Armed with an understanding of the demographic and underlying behaviors, it’s time to consider the necessary features. What Are the Key Features of Mobile Banking? Enterprise banking software is responsible for handling a variety of tasks, from account management to transaction processing. It’s commonly used in retail banking to connect customers to their accounts, but it can also be used by investment banks to facilitate trade with capital markets. Calculation and management of interest. Design and introduction of new banking products. Customer service and relationship management. What’s more, a criteria should be established for interest rates, minimum balances, withdrawal limits, etc. Core banking allows transactions between customers and their bank accounts, including managing loans and mortgages. According to Gartner, core banking applications provide the back-end systems responsible for processing transactions and updating accounts. Core banking relies on an infrastructure that not only connects multiple branches, but that also connects customers with the bank through multiple interfaces such as mobile apps, ATMs, and websites. While core banking has existed for decades, the growth of high-speed Internet has made it possible to perform transactions almost instantaneously. With core banking, users depend on fast, secure software to safely facilitate transactions. Not only do banks have to respond to these demands for faster performance and more features, but they also have to balance costs, existing (and upcoming) regulatory and compliance requirements, and an ever-changing economic landscape. New, non-traditional competition is arriving in the form of alternative payment methods, digital currencies, and big data analysis. Meanwhile, banks have to ensure the integrity and security of user data, providing users with access to their accounts through multiple channels while keeping out attackers. It’s a difficult environment to balance, which is why, in 2013, nearly 96% of the market share for core banking software was shared by only four companies. Closely tied to the growth of core banking is the growth of mobile banking. The widespread uptake of smartphones, tablets, wearable devices, and the idea of constant connectivity has led to a substantial increase in the demand for mobile banking app development. Consumers are using their devices to send and receive money, manage loan payments, and even open and close accounts. This trend will continue to grow as consumers expect more features from their mobile banking services. For banks, managing a mobile solution can be more difficult than it first appears. Financial firms must adhere to GRC (governance, regulatory, compliance) mandates when integrating mobile services. And mobile opens up a much larger potential for data theft, fraud, and data validation difficulties. This raises a number of challenges. Take, for instance, the increasingly popular mobile check deposit feature. This allows customers to deposit checks by using their phone’s camera. However, such a service removes a great deal of control from the bank, while inherently placing it in the hands of the user. Since the bank cannot prevent tampering with the hardware, it needs to implement additional validation steps on the back-end to prevent fraudulent checks from being processed successfully. Mobile introduces the potential for error not commonly found in desktop computers, such as data entry mistakes caused by smaller keyboards and other input methods. Mobile operating systems can be vulnerable to bugs, viruses, and malware not found on desktop machines. Mobile devices also generally have a much broader range of methods for connecting to the Web, from a vast selection of Web browsing apps to Web browsers built-in to various apps. 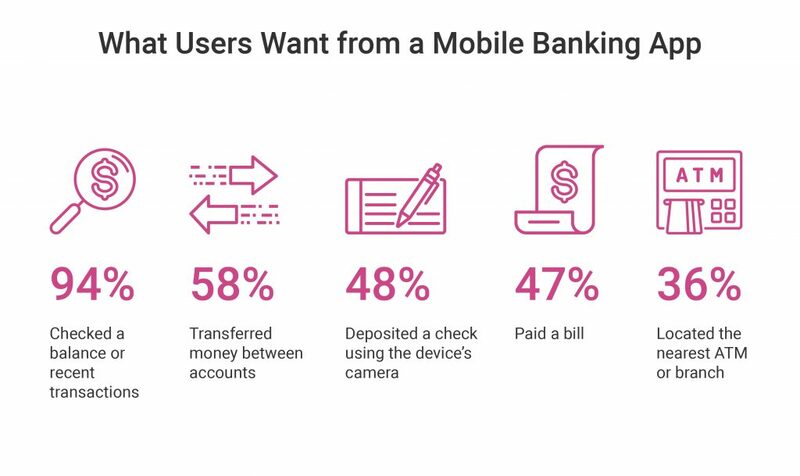 However, since mobile users spend only 14% of their time in the browser and 86% of their time in apps, banks that make use of mobile banking apps gain more control over how their data is transmitted to and from mobile devices. The drawback is that it requires technical knowledge to implement a secure, reliable method of transmitting that data. Mobile banking application development in particular requires a development team knowledgeable in modern security practices. 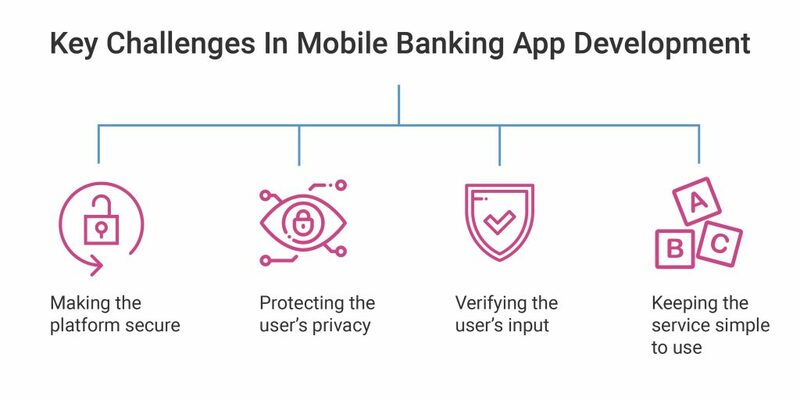 Mobile banking services must be secure, but at the same time they need to allow for flexibility and future extensibility. As banks react to changes in customer expectations, regulations, and available technologies, their core services need to be able to expand and adapt. PIN/TAN systems: The PIN is a password required to login to the app, and TANs (transaction authentication numbers) are a one-time password used to authenticate transactions. The TAN is often sent separately, via SMS, email, or postal services. Biometrics: Touch ID (fingerprint login); facial recognition; iris scanning – these have all been implemented by leading banks worldwide to enhance the security of their apps. Voice recognition: A number of banks now offer voice recognition as an alternative to passwords. All of these requirements stress the core banking system while placing additional demands on top of the system’s existing requirements. Compared to retail banks, trading banks have very stringent requirements on the execution of their back-end software. Financial institutions rely on high-performance systems to facilitate the purchase and sale of financial assets. Artificial Intelligence (AI) for fraud detection and prevention, regulatory compliance, and marketing. Blockchain for the exchange of trade data (among other applications). Big Data Analysis, in order to make timely and accurate recommendations and trades. Cloud-enabled technologies to reduce costs, enhance user experience, and increase efficiency. APIs to improve mobile applications and user engagement. Traders work closely with companies like Arista, Cisco, and Pluribus to continuously upgrade their infrastructure with faster servers, switches, and routers, but the hardware is only a part of the overall system. The ability for investors and traders to make quick decisions is ultimately driven by the underlying software. Exchange markets handle tens of billions of dollars regularly. In August 2018, the Nasdaq alone traded over $117 billion on a daily basis. Much of this consists of high volumes of small transactions, a technique otherwise known as high-frequency trading. It’s difficult – if not impossible – for traders to compete without implementing their own high-frequency trading algorithms, but both traders and investors need a way to quickly track and respond to market volatility. With enterprise banking software, banks have the means to generate transactions quickly and reliably. In addition to providing security and data integrity, banks are looking towards new and revolutionary methods for improving the quality of their services. Short of essential security updates, many banks take a “set and forget” approach when it comes to their core banking systems. While these systems might work, they put older banks at a disadvantage when compared to banks implementing newer back-end systems. Many of these systems are facing a shrinking pool of developers, analysts, and engineers who are moving on to newer, more versatile systems. This leaves the old systems insecure, vulnerable, and out-of-date. Banking application development companies need to design for today’s market, integrating with the bank’s existing systems, but also helping to ensure the bank makes better use of modern trends in data analytics, cloud computing, and instant connectivity. With recent focus on GDPR and high profile data breaches, app security has never been more important. That’s why many banks are turning to big data to detect and fight fraud. Big data is a computing trend that analyzes and creates relationships between large quantities of data from various sources. Big data can pull information from a variety of sources including financial history, mobile devices, and social media. For instance, if a credit card customer who makes most of his or her purchases in New York suddenly makes a charge in Istanbul, the bank could determine the charge as an anomaly and alert the customer to potential fraud. Big data makes heavy use of machine learning, which essentially allows systems to learn and improve through data analysis. Machine learning helps systems detect trends and respond to unusual circumstances more accurately than before, with little-to-no manual intervention. Implementing machine learning can help banks understand their customers’ needs simply by continuing to provide their core services. While many banks have adapted to the growth of the Internet, they’ve done so slowly or inconsistently. For example, mobile deposit has been possible in the U.S. as far back as 2004, but was only implemented for the first time by USAA in 2009. By 2013, only 10% of the banks and credit unions in the U.S. offered mobile deposit. Customers expect to do more with their banks without ever having to set foot inside a branch. To accommodate this, banks need systems that effectively use the Internet to quickly and safely communicate with their users. App personalization. Users are accustomed to customization. Allow them to set the type and frequency of notifications they receive. Simplified navigation. Everything should be intuitive and easy. Provide shortcuts, and ensure that key features can be accessed in as few steps as possible. Sliding scale security. While your app should be secure, the levels of security should match the risk carried by the operation. If your user wishes to make a transfer or deposit, this requires a higher level of security than simply checking their balance. Don’t frustrate users by demanding passwords at every turn. Keep it clean & simple. The best banking apps keep information to a minimum. If the user wishes to learn more, you can link your app with the website, but maintain a clean and streamlined in-app experience. Developing a mobile banking application isn’t just about money. It’s about instilling trust in customers, employees, and investors by providing a secure and reliable platform. Ignite has years of experience leading developing teams and research projects for banking institutions in Ukraine and around the world. With Ignite’s offshore mobile banking app developers, you have access to a knowledgeable and skilled team who can help you expand or replace your existing enterprise banking application. From mobile banking apps to inter-branch transaction processing, we’ll work with you to create a software solution tailored to your bank’s specific needs. Mobile banking application development, which empowers your customers to perform transactions from anywhere at any time. Secure inter-branch and inter-bank connectivity, for processing transactions while preventing hackers from accessing sensitive financial and customer data. Full compliance with regulatory requirements, information security, and risk management. Let us know how we can help you expand your banking services, integrate your back-end systems, and empower you to become a leading financial institution.